Bridalveil Fall is one of the most famous waterfalls in Yosemite National Park, located in the U.S. state of California. Along with the highest waterfall in North America - Yosemite Falls, Bridalveil Fall is one of those beauties of the conservation area, which attracts throughout the year millions of visitors and tourists from around the world. 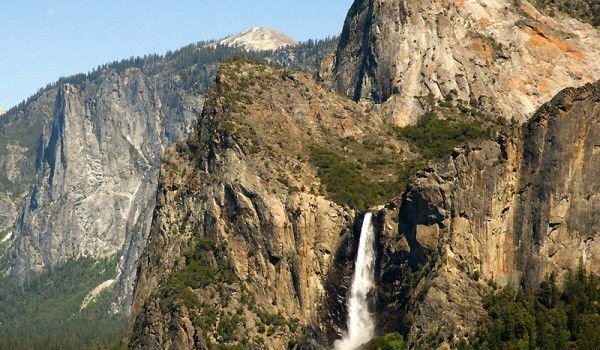 Bridalveil Fall runs down one of the massifs rocks of Yosemite park from a considerable height of 188m. The water is broken down into a cloud of dust from the numerous water droplets resulting from the collision of water with rocks. Bridalveil Fall is abounding in water year round. This is due to the fact that the glaciers that once formed in the Yosemite Valley, to this day are an inexhaustible reservoir for the numerous waterfalls that can be seen in this picturesque natural landscape. All these water channels that fill with water have helped the formation of cascades with our landmarks, but not in Bridalveil. Bridalveil Fall runs down the right edge of the rock in the valley with its beautiful stream, although the rock edge is not in line with the bottom of the abyss as it has slightly shifted over time. The main water source of the waterfall is the Ostrander Lake, which was formed about 16 kilometers south of Bridalveil Fall. The most abounding water is Bridalveil is in the spring, when snows melt. This attractive natural phenomenon is particularly interesting when the valley is windy. The sideways airflow of the water that reaches the base of the lower rocks is of a much smaller proportion than that starting from the rock edge. That is why the local Indian tribe refer to the waterfall as, Ahwahneechee. In a literal translation of Indian language it means, spirit of the wind water. The Ahwahneechee tribe hides some interesting legends associated with the waterfall. These people used the U.S. territories of the natural phenomenon, because they believed that once Bridalveil was the home of a malevolent spirit who guarded the entrance of the Yosemite Valley. Another interesting waterfall in Yosemite National Park is the Vernal Fall.